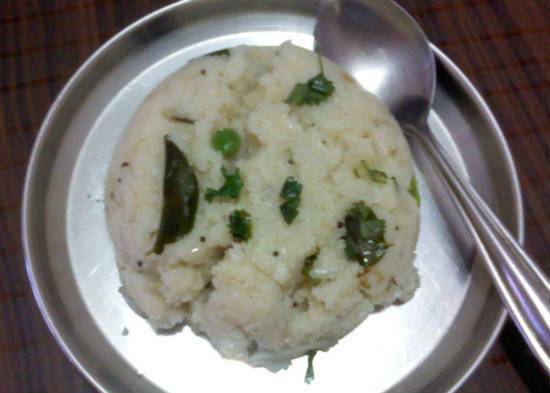 Rava Upma is one of the most popular and traditional South Indian breakfast/evening snack dish. Nutritious, tasty and very simple to make, this is made using rava (sooji) and with an optional choice of veggies. 2. Fry the gram dal and mustard seeds for 30 seconds. 3. Add the green chillies, peas, ginger and salt. 5. Add the rava and pour enough water to the pan. The ratio of rava:water is 1:2 (for every 1 cup of rava, pour 2 cups of water). 6. Stir well and simmer for a few minutes. 7. When it starts to thicken and water has almost evaporated, remove from flame. 8. Add lemon juice and stir. 9. Garnish with coriander leaves and peanuts. 10. Serve hot with coconut chutney. You can also add onions, tomatoes, capsicums if preferred. You can also dry roast the rava for 30 seconds or until golden. Feel free to comment or share your thoughts on this Rava Upma Recipe from Awesome Cuisine.